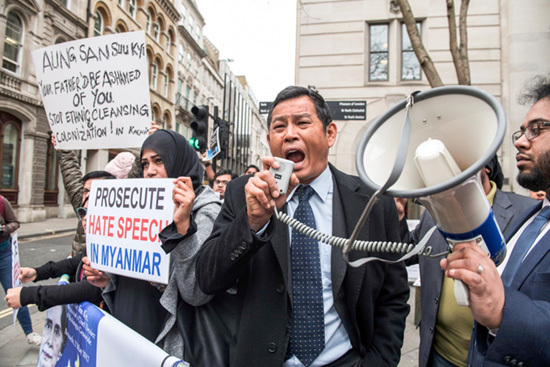 A demonstration against Aung San Suu Kyi, calling for baseless crime against humanity and ethnic cleansing to Rohingya people in Western Myanmar, as she arrived at Guildhall for the award ceremony of Honorary Freedom of the City of London on May 8, during an official state visit to the UK. When the UN Human Rights Council decided to send a fact-finding mission to Myanmar, Suu Kyi rejected this under the pretext that it would further worsen the situation. She also stated that her government is investigating the abuses in Rakhine state. 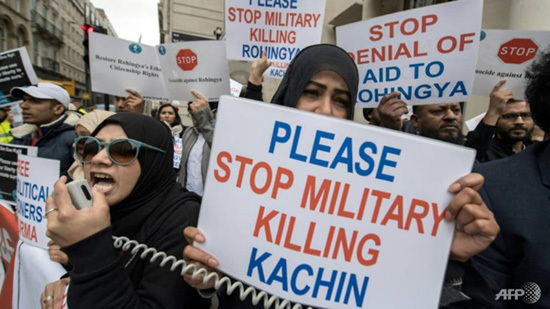 In fact, any investigation her government may carry out in line with its unfair laws, such as the Race and Religion Protection Laws and the law to deprive Rohingya Muslims of citizenship, will not be helpful in alleviating the suffering of these hapless people. She justifies her claims by appointing a panel, headed by former UN Secretary General Kofi Annan, to propose concrete measures to end tensions and improve the welfare of all people in Rakhine. However, Suu Kyi failed to implement the recommendations on the grounds that she cannot implement all of the recommendations at once, according to Dr. Ali Al-Ghamdi is a former Saudi diplomat who specializes in Southeast Asian affairs. 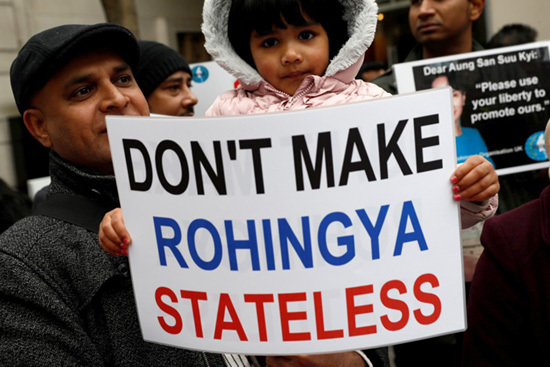 The demonstrators protested outside the Guildhall, with signs reading “Free All Political Prisoners in Burma” and “Please Stop Military Burning of Rohingya Villages”. They chanted “Suu Kyi is lying; Rohingyas are dying” and said that people who had once supported her now opposed her. “We believed that she would be a champion of human rights but she has been complicit with … the junta murdering innocent Rohingyas,” one speaker said. “I’m so disappointed. She needs to stand on her moral ground—people have been dying, people have been raped,” said Ko Aung former security assistant to Suu Kyi and the organizer of event on May 8, outside of Guildhill. “Today Nobel Peace Prize Winner Aung Sang Suu Kyi receives the freedom of London – but what of the freedoms she promised her own people?” said Global Witness’ Paul Donowitz. “The civil wars she pledged to end are getting worse in the north and west, not better. Here struggles for control of the country’s vast jade sector fuels fighting and abuses by the military elites and crony companies that are meant to be a thing of the past. If she is to deliver the peace she promised Myanmar, Suu Kyi must focus on ejecting men with guns from the mines and sharing the country’s riches fairly. That needs to start at the upcoming peace talks,” Donowitz stated. Since a military crackdown began last October, the UN has claimed that more than 1,000 Rohingya have been killed in the army’s operations in Rakhine, and at least 70,000 Rohingya have fled to neighboring Bangladesh. The City of London Corporation provides local government and policing services for the financial and commercial heart of Britain, the ‘Square Mile’. This entry was posted in English, News and tagged Arakan, Aung San Suu Kyi, London, Protested, Rakhine, Rohingya. Bookmark the permalink.